Big day, folks. HUGE day. For the first time in nearly four months, four long and painful months, four months filled with vicious assuming glares from strangers, I was able to wear my wedding rings. I may have shed a tear the day I had to remove them for fear that if I didn't, I may wake up one morning with the emergent need to remove a digit and I most certainly cried a little when I was finally able to slide them back on my oh-so-naked ring finger yesterday evening. I'm not lying when I admit to trying them on almost every single day since the bith of C. And just when I was about to call the jeweler and ask them how long it would take to resize a wedding set, I turned on the shower to the coldest setting and stepped inside armed with fiery motivation and a bottle of Pantene Pro-V deep conditioner. Can you blame me for missing them? I just need to keep reminding myself.. baby steps. Wedding rings today? Who knows what lies on the horizon. I am so jealous! I still have yet to be able to wear mine. Le sigh. happy you were able to get your rings back on! i'm 7 months pregnant now and still have them on (although my finger is cursing me because they are tightttttt). Doesn't it feel great! I finally got mine on this week too...oh how I missed them! Your wedding set is beautiful, I can totally see why it would be hard to have to keep them off for that long! I have been lucky (crossing my fingers) so far... but who knows, I may be on the same boat soon! Hahaha I LOVE this. Too cute! So glad you're "married" again! And wow, what a beautiful ring! Your ring is stunning... wow. I can see why you missed wearing it so much! So happy for you! 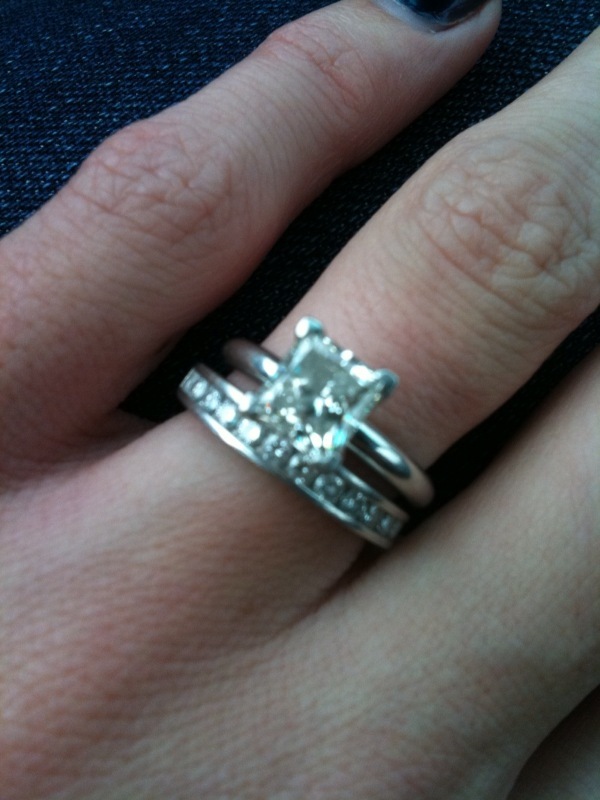 My sister finally ended up resizing hers....after a full year the fingers just wouldn't go back to how they were! Congratulations on such a happy event!!!! Oh I am still waiting for that day! I can wear my wedding band but my E ring is a 1/2 size smaller so I haven't had it on in MONTHS and I miss it terribly! I try to FORCE it on EVERYDAY! Glad you are able to wear yours again! There was about a four month period for also when I was pregnant with my son. It was definitely a monumental day when I could put mine back on! I'm SO jealous!! Cooper is 3 months old and I STILL cannot get my rings on! Your ring is GORgeous! Ooooh la la! Bet that feels like a major milestone!